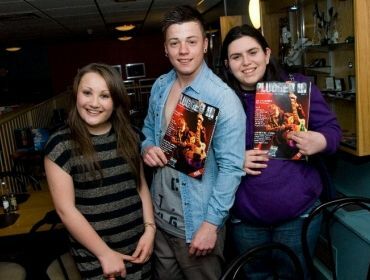 On the 23rd March, members of the Rhondda Editorial team went to the launch of Rawr Magazine, which was way more fun than I expected it to be. After a delayed pick up and arriving at The Muni Arts Centre, Pontypridd, not very long before the start, we sat down in our seats and said hello to each other (some of us were there before others, and I even bumped in to my residential buddy, Toriabeth!) and then the evening began with a welcome and an introduction to Rawr Magazine. Then followed a performance by the Get Fresh Crew which were truly amazing. Honestly, they can really dance well! Once the performance was over, Councilor Hanagan gave a speech about the whole project, then began to give out awards to all who took part in creating the magazine. When Toriabeth! went up for her award, I think I was the loudest person there rooting for her. When it came to Treorchy Comp having awards, Treorchy’s E3+ co-ordinator, Hannah, popped out of nowhere and asked Matthew.Mcclaren and I to step in and represent Treorchy, since the boys who took part in writing for the magazine were not there. I was a little bit shocked since I wasn’t expecting to be going up on stage at all. I also felt a bit of an idiot when the photographer made us shout “YEAH!” to the camera. I don’t know why he made us do that, as since the last time I checked, photos don’t talk. But that’s why I’m not a professional photographer. Anyway, after the certificates were given out, there was a performance by The X Factor’s Tom Richards. I turned around to look at Toriabeth and her eyes were gleaming as she had a very large smile on her face. So when it came to performing his last song, a cover of All Time Low, other girls got up to dance by the stage and I turned to her and said “Come on, lets go down there.” Yeah, I felt like a dipstick, but I knew she wouldn’t go on her own, so I thought “Ahhhhh……I’ve embarrassed myself in worse ways. This won’t harm me! After Tom’s performance, it was buffet time. I think PeterPiper and Matthew.Mcclaren were quite hungry since they practically dived into the queue. I was too busy trying to ask if we could interview Tom (Not that I’m obsessed with him, but I just wanted to do something other than sit and stuff my face). After queuing for ages to get his autograph and ask him if Toriabeth and I could interview him, he said “Yeah, let me finish up these autographs and I’ll be with you.” Toriabeth and I looked at each other, walked away calmly and then she started squealing with excitement, so I joined in, too. After a few minutes of waiting, we went into the cafe area to interview Tom. He was really nice and was easy to talk to. He joked around at one point by grabbing a menu and saying “Right, what are we having, then?” and I just randomly replied with “You’re paying!”. He was great answering our questions and he made us laugh! Once we had interviewed Tom, we interviewed B-boy Slammo who had created Get Fresh (The official break dancing crew for RCT) he also made us laugh loads and was really nice too. The evening was really good and it’s great to see so much talent around our area. woo! that was so much fun, possibly the most exciting monday night I’ve ever had!